Children learn English naturally at home. Parents do not need to know English. Books, videos, educational games. Only useful content for the child. Full safety of the child in the Internet. No ads and outside links. Completely excluded the transition to other sites. Everything is under complete control of teachers and parents. Internet Illusion for the child! Parents save a huge amount of time! The client "Baby English Best" provides complete child safety on the Internet and the security of your computer. No links to external sites. Full screen mode. The child can not minimize the window and go to the desktop, damage the computer system, erase the necessary information, infect the computer with a virus from the gaming sites. Parents can safely leave the child with the computer. Perfect libraries. Everything is easy for use. Books were sorted by series and age. It is absolutely no problem if you are not fluent in English. All books have audio tracks. Reading is very important for child! Children like to watch YouTube. Educational and interesting Videos for children. All materials are chosen by children and teachers. In one click parent can switch off channel. That’s what children really love. We use games for learning and development of a child. Main tasks of the games are Mathematic and Language learning, logic development. Good quality suitable for watching on PC, tablet and TV. In minutes, parents can edit what will be available for their kids according to his or her age. Website “My Friends (Video Chat)” - Children can talk to each other and with a teacher. Web Site “Win a game” - Games between children online and with a computer. These is a very important sites for stimulating children to speak. Be sure to follow the rule for parents. Control by parents and teachers. Statistics of views and completed tasks. The developed system of incentives and rewards. This is very important section of BabyEnlish.Best. Recommendations, activities, useful links for children education. Switch off/on KidsTube channels, cartoons, movies, book sets. Replenish three my favorite websites - My books, My Videos, My Games. Dedicated program to study English language for children up to 4 years old – activities (active games), video lessons, check lists. We create conditions for children to learn English naturally. They will learn English as their native language. ■ Educational materials for children learning English. ■ 50+ video books (English and Russian) on our YouTube channel. Books are available to our subscribers only. Subscribe to our channel and get free access. 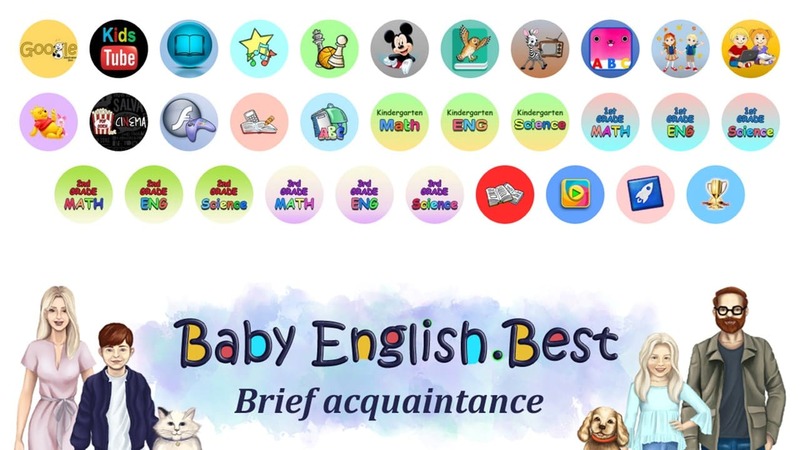 Go to BabyEnglishBest YouTube Channel. ■ Quotes and Sayings about children education - Download PDF file.